This week's super art deal are these beautiful mixed media Mermaid boxes by Illinois artist Carmen Lozar, currently on exhibit as part of the "Compelled by Content II" exhibition. 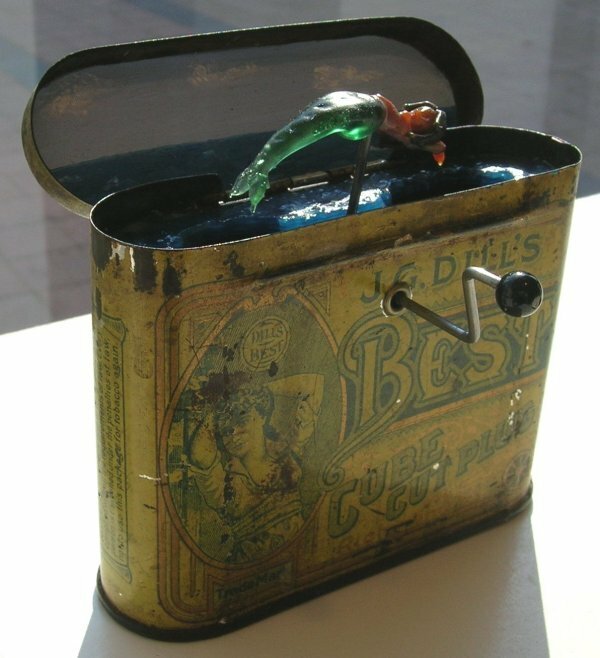 Each of these interesting sculptures starts with a found object, in these cases an antique cigarrette or snuff box. 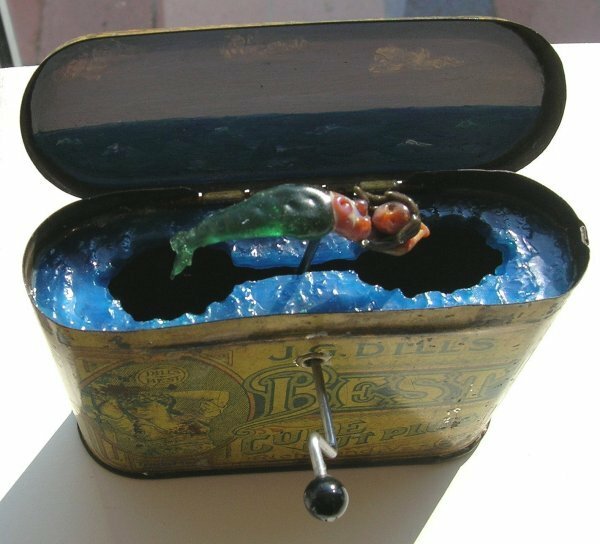 Lozar then transforms the object by casting a blue ocean made of glass, and also creates a small glass mermaid that can be rotated through the ocean through a small lever handle that she builds into the side of the box. The inner lid of the box is also a small oil painting of the ocean's horizon. These interactive pieces can then be "rotated," making the small glass mermaid jump in and out of her glass ocean. Two of the three boxes below are still available for sale. 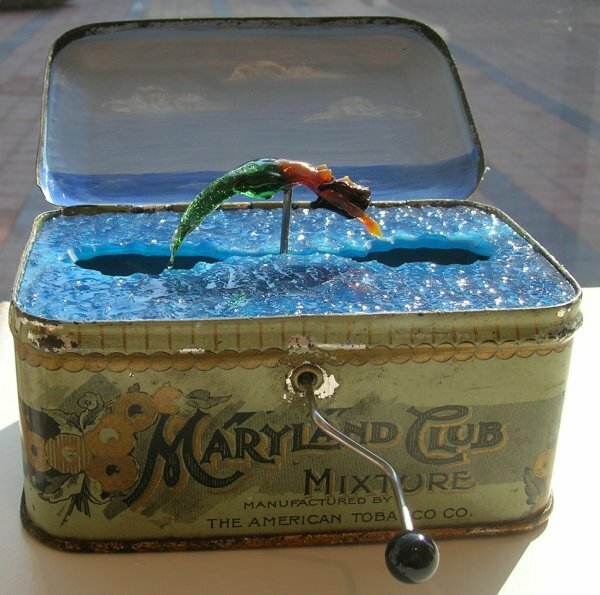 The one below is an old "Maryland Club" tobacco tin measuring four inches long by 2.5 inches deep (closed) or five inches deep open and about three inches high with mermaid in the up position. The second box is an antique J.G. 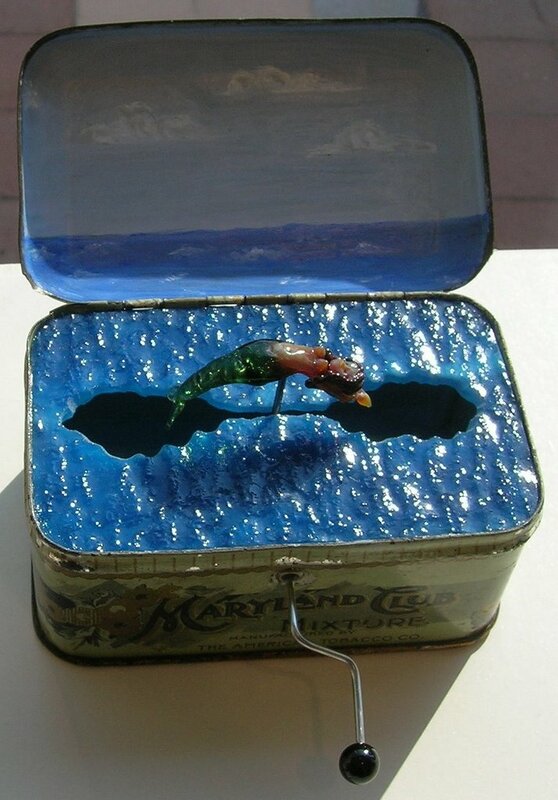 Dill's Best Cube Cut Plus tin measuring 3.5 inches long by one inch deep (closed), two inches deep (open) and 3.5 inches tall with mermaid in the up position. Each of the sculptures is $600. To buy them call the gallery at 301/718-9651 or email them at info@thefrasergallery.com. The 21st Annual Corcoran College of Art + Design Print Portfolio is now on view through May 27, 2006 at the Kathleen Ewing Gallery. This year’s portfolio contains the work of Corcoran College of Art + Design faculty and students from the BFA and Continuing Education programs. as well as guest faculty and artists. This year they have included work by Frank DiPerna, Claudia Smigrod and Renee Stout. This exhibit has been titled Thinking Voodoo ; Why? Because as the city of New Orleans is historically linked to the practice of voodoo and the supernatural, Thinking Voodoo seemed an appropriate title for this year’s portfolio following the events of Hurricane Katrina and its aftermath of destruction. One copy of the full portfolio is placed in the permanent collection of the Corcoran Gallery of Art, the Corcoran College of Art + Design and the College Printmaking department, however copies of the work will also be on sale.